Show Lo (simplified Chinese: 罗志祥; traditional Chinese: 羅志祥; pinyin: Luó Zhìxiáng; born July 30, 1979) is a Taiwanese singer, actor and host. He is commonly known by his nickname Xiao Zhu (Little Pig) (simplified Chinese: 小猪). Lo is recognized for his trademark dance music and comedic talent. He has over 50 million followers on China's micro-blogging platform Weibo as of June 2018. 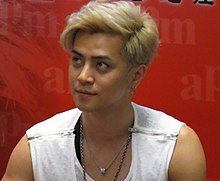 Show Lo debuted as a member of Taiwanese boy group in 1996 after winning a singing and dancing competition, and began his solo music career in 2003 when he released his first studio album Show Time. His successive albums were commercially successful; he achieved best-selling album of the year in Taiwan for four consecutive years from 2010 to 2013. He holds many records in the Taiwanese music industry, including being the first pop singer to hold a concert in Taipei Arena in 2005, and the first pop singer to hold three concerts within twenty-four hours in Taipei Arena in 2010. As of May 2018, he has went on four world tours. His 2010 舞法舞天 (Dance without Limits) World Tour ran for two-and-a-half years, visiting forty-two cities and attracting 600,000 spectators. Lo is fluent in Japanese and released his first Japanese single EP Dante in 2012. The song clinched 5th place in Japan's Oricon daily charts on its first day of release and remained at 10th place in the Oricon weekly charts, making him the first Taiwanese male singer to place on the chart. Besides his singing career, Show Lo is a successful television host and entertainer. He has been hosting 100% Entertainment since 2001. In 2017, he won the Best Host for a Variety Show Award in the 52nd Golden Bell Awards for 100% Entertainment, with co-host Linda Chien. He is also recognized as a member of the cast for the popular Chinese reality show, Go Fighting!, and as a judge on China's Produce 101 and Street Dance of China. Show Lo was nominated thrice for Best Male Actor in the Golden Bell Awards. In 2013, Lo was handpicked by director Stephen Chow to play the guest role of Prince Important in the movie Journey to the West: Conquering the Demons, which broke Chinese box office records. Chow cast Lo again in a supporting role, Octopus, in his 2016 movie The Mermaid, likening his comedic talent onscreen to a formidable explosive. The movie once again broke existing Chinese box office records. In 2006, Show Lo created fashion brand STAGE which currently has branches in Taiwan, Hong Kong, and Singapore. STAGE sponsors clothing for many Taiwanese entertainers, and the brand is often seen on Taiwanese variety shows. Show is nicknamed Xiao Zhu (Little Pig) because he was really chubby when he was young, weighing over 100 kilograms. He was bullied by his classmates for his weight, which made him determined to slim down. During the summer break of his first year in middle school, Show swam and played basketball everyday, shedding weight and reaching 80 kilograms within two months. In 1996, Show entered and won a singing and dancing competition, impersonating Aaron Kwok. He debuted as member of boy group Four Heavenly Kings with three other contestants who impersonated the other Hong Kong Four Heavenly Kings. The boy group disbanded in 1998 as two members left for compulsory military service, which Show was exempted from because he has Gluteal Fibrotic Contracture. He also suffers from Mitral insufficiency and hence cannot consume food containing caffeine. That same year, he formed a new boy group Romeo with Ou Di. They released two albums, but the group soon disbanded too. His second album, Expert Show, was released in 2004. The leading dance track "機器娃娃" (Robot Doll), is a hip hop number about the prevalence of electronic pets and on-line relationships. He collaborated with his co-host Xiao S on the duet "Love Expert" (恋爱达人). In 2011, Show signed with Pony Canyon Japan. His first Japanese single "Dante" was released on February 15, 2012. This song made it to the 5th place in Japan's Oricon daily chart during its first day of release, and hit 10th place in the Oricon weekly chart. This record made Show the first Taiwanese male singer to be on the Oricon chart after Teresa Teng. On September 19, 2009, Show represented Taiwan and performed at the 6th Asia Song Festival, held at the Seoul World Cup Stadium in South Korea. Show Luo's eleventh album "Reality Show?" was released on November 20, 2015. The title is derived from Show's personal reflection on his persona, commenting that what he presents has elements of both 'Reality' and of putting on a 'Show'. He co-wrote the music and lyrics for the leading track, "Let Go", which discusses the issue of cyber-bullying. The music video depicts three subjects representing the demographics most vulnerable to cyber-bullying. ^ VIKI. "Show Luo". VIKI. VIKI. Retrieved December 8, 2015. ^ "Sina Visitor System". weibo.com. Retrieved June 27, 2018. ^ "Show Luo's new Japanese Single "Dante" places 10th in Japan Oricon Charts - Asian Entertainment News 2012 (Archive)". AFspot Forum. Retrieved May 28, 2018. ^ "100% Entertainment/100 Percent Entertainment". GTV. Retrieved May 31, 2017. ^ "Show Luo wins a Golden Bell award after 7 years - Toggle". Toggle. Retrieved May 28, 2018. ^ "'Street Dance of China' to show off the coolest dance moves - SHINE". SHINE. Retrieved May 28, 2018. ^ Frater, Patrick (January 30, 2017). "China Box Office: 'Journey 2' Smashes Records in Holiday Weekend". Variety. Retrieved May 28, 2018. ^ "周星驰：他是当之无愧的"喜剧原子弹" 而他却回了周星驰三个字-腾讯网". new.qq.com (in Chinese). Retrieved May 28, 2018. ^ Frater, Patrick (February 23, 2016). "'The Mermaid' Becomes Highest-Grossing Film Ever in China". Variety. Retrieved May 28, 2018. ^ ilovestage. "Stage". ilovestage. ilovestage. Retrieved December 8, 2015. ^ "罗志祥自曝童年黑胖穷！". xw.qq.com. Retrieved May 28, 2018. ^ "为什么罗志祥没有服过兵役？拜托了各位 谢谢_百度知道". zhidao.baidu.com. Retrieved May 29, 2018. ^ "Show Luo's new Japanese Single "Dante" places 10th in Japan Oricon Charts" February 23. 2012. Retrieved 2013-05-01. ^ "Show Lo（羅志祥）Releases New Album "Reality Show?（真人秀？）". Yelling "Let Go（夠了）" to Cyberbully.=Sophia". Taiwanbeats. Taiwanbeats. October 30, 2015. Retrieved December 8, 2015. ^ Channel Manager. "Once More Heartbeat". VIkI. VIKi. Retrieved December 8, 2015. ^ Show Luo becomes an author and gets some motherly advice November 30, 2010. Retrieved 05-03-2013. This page was last edited on 19 April 2019, at 08:17 (UTC).